Memorial Day Party – How to eat healthy (with food they will love!). You will also need skewers. Mix olive oil, honey, and lemon juice well. Cut up the chicken breasts into 3 inch slices and mix with the olive oil mixture. Let set for 3-4 hours. Meanwhile, soak the shish kabob skewers in water. Cut up the red onions into strips. Place two pieces of bell pepper and two mushrooms with two pieces of the chicken in any order on the shish kabobs. Place onion strips throughout on the skewers. Place on grill until cooked thoroughly (around 15 minutes) or you can broil them in your oven for around the same time. Make sure that you rotate them as they are cooking. Cook pasta according to box directions omitting any salt and drain and cool pasta. Mix the rest of ingredients together with pasta and refrigerate until chilled. Rinse strawberries under cool running water. Remove stems and cut into chunks. Add Sugar. Stir and lightly smash berries. Refrigerate for an hour. 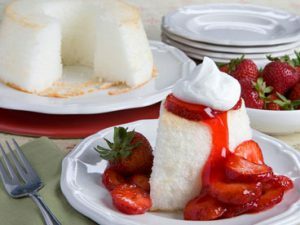 Slice Angel Food cake in to 12 pieces. Lay one slice of cake in bowl and top with 1/6 the strawberries. Top it all off with 2Tbsp Cool Whip. ENJOY!